What role do the senses play in development? 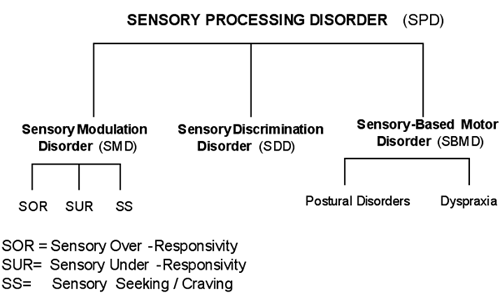 What some of the indicators of a Sensory Processing Disorder (SPD)? What techniques may be used during the treatment process? What are the expected outcomes of the treatment? Sensory Processing Disorder (SPD) is an inability to process information received through our senses for generating appropriate responses. The result of this is a decreased ability to respond to sensory information in order to behave in a meaningful & consistent way. It can also lead to difficulty in using sensory information to plan and organise our own body & make sense of the environment in which we function thus impacting on our ability to learn. (Adapted from Miller, 2006). This is where the child has trouble controlling, planning and supporting their movements into a smooth, coordinated and sequence way. Children can present with a combination of sensory processing patterns or may only have one of the above discussed difficulties. The senses provide us with essential information about our own body and the environment in which we function. They provide us with information about where our body is in space, how our body is moving, what impact the environment is having on our body, what is happening in the environment and help us in knowing how to effectively respond to task and environmental demands. Let’s think about just the simple action of walking down a step something which we are able to do without looking or even thinking about. How do we know where our body is, how do we know to shift our balance between our feet, shift the balance of our body, know when our foot has touched the step without even looking? We know because each of our sensory system is telling us what is happening and helping us to generate appropriate responses. Our sensory system is the foundation of our skill development and is like laying the foundations for a house. Whilst some structures may be able to be developed without the support of the foundations it does not become a structurally sound ‘house’ without good foundations. Just as we need a foundation to build a house we need effective sensory processing for the development of our skills. If we are unable to process information on this foundation level we are required to pull in higher cognitive functions to help make sense of our world. This increased cognitive effort is difficult to sustain and can take away the free cognitive space left for working on more complex tasks e.g. handwriting, riding a bike etc. Parents of children with SPD often find it hard to get a diagnosis. They intuitively know that there is something wrong for their child however unless they encounter a trained professional their concerns may be overlooked, misinterpreted or dismissed. When parents do get a diagnosis they report that this is the first time that someone has truly understood their child and given meaning to the difficulties which their child is experiencing and which they encounter as a family. Finding an Occupational Therapist who is trained in Sensory Integration is an essential step in gaining a diagnosis of Sensory Processing Disorder. Not all Occupational Therapists are trained in this area and therefore may not address the underlying causes of some of the mre evident difficulties e.g. handwriting, attention, social, play and motor difficulties. Persevere in finding an Occupational Therapist and a team of professionals who are trained in assessing your child to determine if they do have a sensory processing disorder. ‘Sensational Kids OT’ is able to provide a comprehensive assessment to look at sensory processing and if appropriate a diagnosis of SPD. OT is fun and most children will enjoy participating in OT sessions despite how hard they are working! The aim of therapy is to impact the development of how the body responds to the sensory messages it receives and how to produce meaningful responses. Therapy also aims to educate parents, caregivers, families, childcare workers and teachers to provide a context which is conducive to the child’s sensory processing style. Under the guidance of a therapist, the child actively takes in sensation through a playful context. The therapist will help to activate the neural pathways and provide organization within the central nervous to produce more regulated responses. It aims to provide a neural platform which promotes the development of more complex skills by freeing up the higher cortical levels which are currently being used to process sensory information. The child responds favourably to SI treatment, because the nervous system is pliable and changeable. Rather then addressing the symptoms we are addressing the underlying causes which are essential in sustaining change. Therapy teaches the child to succeed—and they love it! The specific goals of occupational therapy using a sensory integration framework are to improve the person’s social participation, self-esteem, self-regulation and sensory-motor abilities.